My partner Darren is a big fan of “healthy fast food”. While I prefer to avoid the excessive packaging that comes with take-out, his menu item of choice from Chopped Leaf (The #1 Whole Bowl) has won my heart. Instead of becoming a regular customer at the chain-restaurant, however, we’ve started making our own, healthier version at home. It’s so easy (and delicious), you may want to enjoy multiple times a week for lunch or dinner. 1. 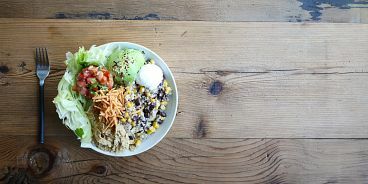 Chop iceberg lettuce into bite-sized pieces and place in a large bowl along with quinoa, corn and beans. 2. Squeeze limes and drizzle olive oil onto your lettuce mixture and toss, then divy portions out into two big bowls. 3. Garnish each plate with half an avocado, a handful of crushed chips, sour cream, cheddar cheese, salsa, s&p.